Yesterday was Scottish, today was Greek. 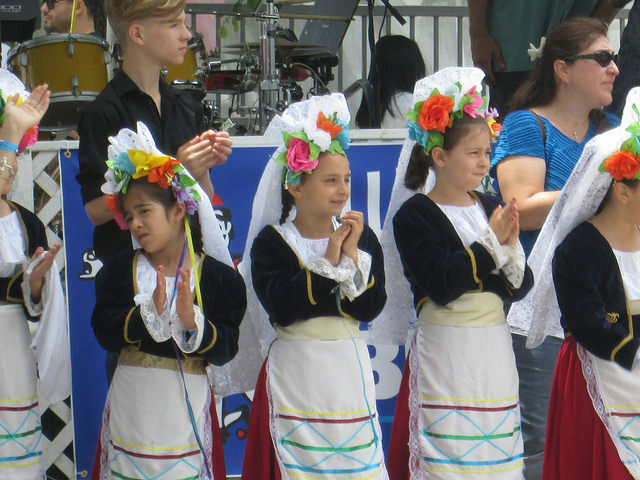 Every Memorial Day weekend, Saint Nicholas Greek Orthodox Church in North Hills puts on a three-day Greek festival with food, dancing, and vendors. It is one of three Southern California Greek festivals that Martine and I attend. For Martine, the main attraction is spanakopita, Greek spinach and cheese pie, the baked goods redolent of honey and nuts, and he beautifully decorated church. My preference is to see the children dancing. As they go through their steps, members of their family step forward and shower the dancers with one-dollar bills, which are picked up after the performance. And, although I was raised as a Roman Catholic, I have always had a warm spot in my heart for the Greek Church. I sometimes wonder what will happen in the years to come as the younger generation grows more detached from the values of their parents. Many of the older parishioners still speak to one another in demotic Greek, while the children are just American kids trying to make their own way in the world. When the girls in the above picture grow up, will the old ways matter to their own children? What about the Greek language? the cuisine? even the religion? Are we seeing the last florescence of children trying to adhere to their parents’ folkways? Perhaps not. Trumpf to the contrary, America is still seeing waves of immigrants, mostly from Asia and Latin America. As a Hungarian, I am closer to the European ethnic ways; though the Central Americans and Koreans and Persians also have a lot to offer. This entry was posted in southern california and tagged ethnicity, greek-festival, greek-orthodox-church, immigration. Bookmark the permalink.